Grace and peace to you from God our Creator and our Lord and savior Jesus who is the Christ – will y’all pray with me? May the words of my mouth and the meditations of all our hearts be acceptable in your sight O Lord, our rock and our redeemer. Amen! So, we are so tantalizingly close to celebrating the birth of our Lord. Most – if not all – preparations (that we know of) are covered. Cards sent out, presents purchased, gifts wrapped. Now we just wait a few more days. In the life of the church, things are getting prepared as well. As you see here in the worship space, we’ve been adding just a little bit more each week as we move close and closer to the day of our Lord’s Nativity and birth. Trees, decorations, flowers, handbell tables. There have been preparations with bulletins, and liturgy, and music, and volunteers, and more. We are in the midst of preparation. And for the most part – for the most part – things are going OK. We know what lays before us. Sure, some things can get out of whack a bit, but we’ll handle it – like the phones not working right now. We can be calm. I think about the calmness that Mary must not have really been feeling in our gospel lesson this morning. She’s been visited by an angel, she’s been told she is carrying a child. Not only that, but this kid is going to be kind of a big deal for the world. Teenage pregnancy is stressful enough today; what with the looks and the whispers that people always give towards a young pregnant woman in our world. Adding on top the risk of potentially not being insured – or insurance potentially not covering the pregnancy, or not covering it in a way that the cost would be manageable. And that goes for anyone, let alone a young woman with possibly no income. And even seeing that stress lived out, I still cannot imagine what it could’ve been like back in Mary’s time. Imagine for a moment all the things that Mary would be worried about. Yes, she boldly listens to the angel and accepts her role as the bearer of God’s child for the world, but that doesn’t mean there isn’t a bit of fear, apprehension, and worry on her part. She isn’t married. She’s young. She lives in a culture that not only looks down upon a young girl in her situation, but she could be killed for bringing this sort of shame not only to her family, but especially because she could bring shame to the one she is engaged to marry. Lay on top of that – the angel has said who this child will be for the world. As a commentator wrote this week, there is space – perhaps even a pregnant pause – between verse 38 and where our text this morning begins at verse 39. A lot can be fit in that space. For you see, Mary leaves in haste to go visit her cousin Elizabeth. She needs to talk to someone and she possibly doesn’t feel like she’ll get it from those around her. And can you blame her? Who would believe this girl that God had gifted her this child? What would her friends say? Her parents? Her community? Her Joseph…? I imagine that she is scared and full of panic. Hopefully her cousin will be able to comfort her and offer her support. Imagine what that journey could’ve been like for Mary? Imagine what the journey is currently like for those within our world, community, and country today. Those who seek help, support, and comfort when thrust into this potential at such a young age. Mary finally arrives at the doorstep of Elizabeth’s and Zechariah’s home. She crosses the threshold, and everything seems to change. As she enters the home, she is not greeted with side-eyes, shade, and disapproving sighs. No, she is greeted with love, joy, and praise. Elizabeth welcomes her young cousin with praise and adoration. She knows what’s going on. She herself has received the remarkable blessing of pregnancy from God in her age. She knows already that Mary is pregnant and how special her child will be for the world. She welcomes Mary with praise and blessing. Blessed are you Mary. Blessed is the child you carry! You are blessed cousin! She welcomes Mary to come, to rest. I imagine that there was a massive and relieved hug and sigh from both of these women. It is in this moment, that Mary bursts into song. Adding her own rendition to the words that the community of God has lifted up through the generations. Those words of hope. Those words of salvation. Those words of remembrance. Those words of God’s love bestowed upon creation. Mary’s song erupts from her very being after she is loved and welcomed by her cousin. After she receives support and praise from another. Her song doesn’t begin when the Angel tells her of her current situation and future. Her song doesn’t crescendo on the road like a Disney princess in a travel montage. No, Mary’s song of hope for Israel and the people of God breaks forth after she is welcomed in love and support. Mary begins to sing after she finds help, refuge, and support. I wonder what life would be like for those young women in our world today who are carrying children before society thinks they should if they were greeted as warmly as Elizabeth greets Mary. Opening homes, hearts, and love with support, refuge, and love. What would the church look like, what would the community of faith look like, if we looked upon each person we see as a potential bearer of God’s light and life? How would we view the world, how would we live in this world, if we greeted all we met – no matter who they were, where they came from, or what situation they were in – with grace, care, and love. As we move closer and closer to the celebration of our Lord’s birth, we remember the strength of Mary and Elizabeth. The strength of these women to find comfort in one another and the strength to believe each other in their stories and truths. These women – both of them – provide us a model and guide in how to welcome and seek help and guidance. These women can and should teach this community of faith and the entire Church universal of what it means to welcome the one before us – no matter their situation, origin, or story. 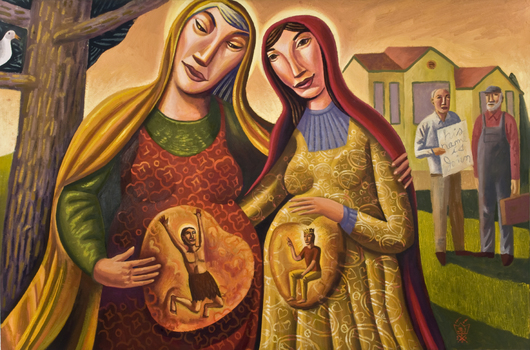 As we approach Christmas Eve – the story of an unwed mother giving birth, what does it look like to – how do we live into – welcome the one before us in love, grace, and hope? How do we welcome and love as God welcomes and loves each of us? Offering love, refuge, food, drink, and life. Let us all welcome like Elizabeth. Let us all seek help like Mary. Let us all see God present in the midst of the stories before us and in the lives of the people around us. Amen.